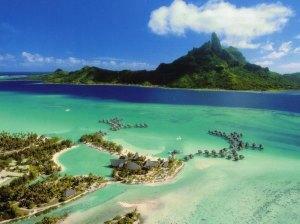 Bora Bora is known as the most famous island in the world. One would think there would be the home of the world’s best beaches. We’ll give that honor to the Seychelles. In the meantime, we’ll tell you where those strips of pristine white powder can be found, and uncover more wonders of Bora Bora. First, don’t think you can’t get here. 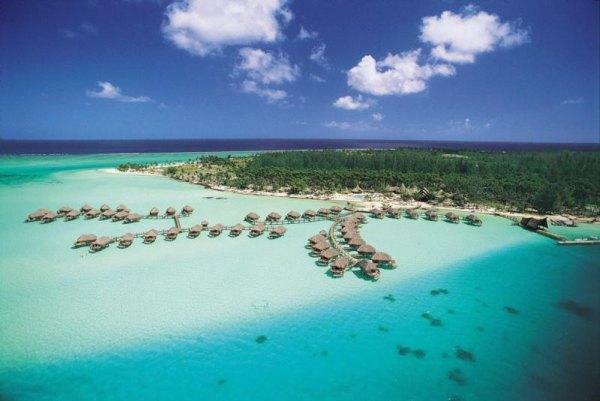 Bora Bora is very reachable as a vacation destination. 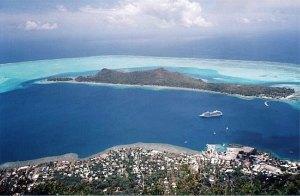 Once in Papeete, Tahiti, you’re a short hop to the island paradise. While you’re hopping, don’t close your eyes. The colors are simply breathtaking. Some say there are more than five shades of blue/turquoise as you are coming over the lagoons and reefs. As you approach, you’ll see the two towering peaks of black rock that dominate the center of Bora Bora. These are framed by the blue waters and world famous lagoon that captures your attention. Of course, the lagoon is the centerpiece. You can wade in it, swim, snorkel, scuba, jetski, windsurf, or just take it in as the most wonderful piece of nature it is. It’s really up to you. And believe us when we tell you, your vacation to Bora Bora will never be forgotten. Bora Bora has a few different options of lodges, from plush resorts right on the lagoon, to family owned pensions – and if you’d like, there’s even a campground on the island. Let’s start with the plush. These are where you go when you want your every whim catered to. Expect the best. 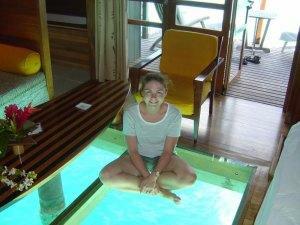 Most have overwater bungalows with impressive glass floors. That’s right; the floor of the bungalow is glass, and lit at night so you can look over your bed and watch the fish wander by through the evening. Some bungalows have manta rays that stay all night feeding on plankton drawn to the light. Other bungalows have only glass bottomed coffee tables, which are chic, as well. There are full-sized bathrooms, with tubs and hot and cold water – all the conveniences of home – thousands of miles away in the Pacific. 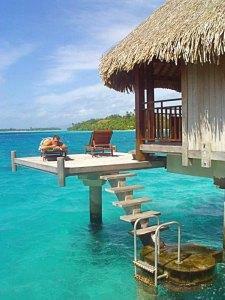 Many of the bungalows on Bora Bora will have ladders that lead from the lanai (porch), to the surface of the ocean. 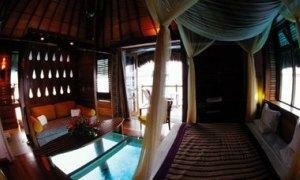 These come complete with showers to wash off the sea after a relaxing snorkel in the surrounding lagoon. 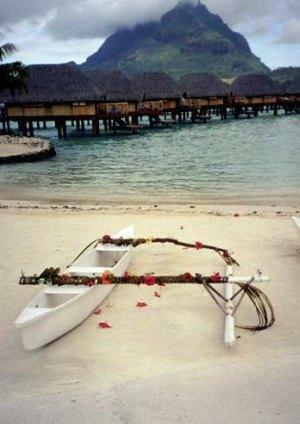 Room service is special – the hotel will run it out to your bungalow in a classic outrigger canoe. You simply sit back, relax as you take in the view. But don’t make every meal in the bungalow – most hotels use the beachfront as a dining room as your hotelmates gather to dine as the sun goes down. How romantic! 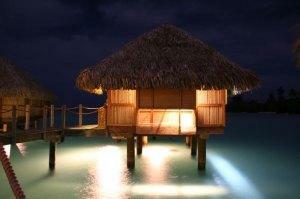 Many come to Bora Bora on honeymoon, but note that most hotels perform Polynesian weddings as well. You’ll receive royal treatment and an unforgettable vacation, wedding and honeymoon. What more could you ask for? Remember that all bungalows are not overwater. Some are garden views, some are called beach bungalows. The overwaters are the most spectacular, carry the higher price tag, and fill up first. Make sure you make your reservation early! You land on one small section of the barrier island surrounding the main island. You are taken by boat to your hotel. After check-in at your hotel, and once you’re set up – there is a wealth of things to do on Bora Bora. Snorkel in the lagoon. All hotels have equipment rentals. Also check out the spectacular diving around the island. Your local dive shop will do their best to convince you to enjoy a shark feeding. There have been no reported accidents, so based on their record, they seem pretty safe – and how cool! If your idea of fun is above the water, try windsurfing, jetskiing or kiteboarding. 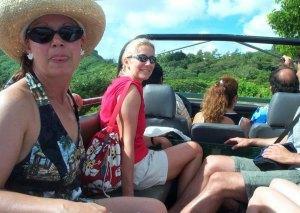 Or… our next choice – four-wheel island safaris. During the war (WWII), American soldiers carved out roads that circle around the ridges of the islands. Created to care for gun mounts (you’ll see those), and other points, these roads offer the absolute best views of the islands. You’ll see Raiatea, Tahaa, and Maupiti islands and your local guide will educate you with historical facts, humor and spectacular scenery. It is well worth the price. Don’t miss this. Next, we recommend the half-day tour around the island by boat. The crystal-clear water will enchant you as you relax in the sun. 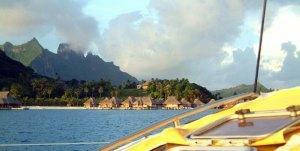 Some tours offer a meal as you glide through the waters around the perimeter of Bora Bora. There are smaller boat tours, but you will enjoy the larger vessels as waves can get choppy. 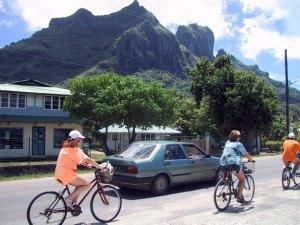 Another fun adventure is renting bicycles and riding around the island. A paved road, thanks for the Americans, circles the island. You can take three or four hours, or all day if you choose. It’s that big. Again, views are breathtaking, people charming. Make sure you stop at a few of the many local stores along the way. And finally, the beaches – yes, there are a few. They all surround the best beach, Matira Beach. The only public beach on the island, Matira is plush and a photographer’s dream. The sand is medium to fine and the coast here is dotted with jetski rentals and smaller hotels. Plan a few hours here, if possible. Matira has been named one of the top ten beaches in the world. 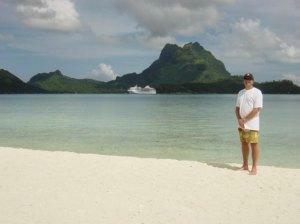 Enjoy your stay on Bora Bora and make sure you visit our other reviews and pictures of Best Beaches in the World.